After a tense day of waiting indoors while police combed the city for the at-large suspect in the Boston Marathon bombing, Dzhokhor Tsarnaev, Bostonians were told they could finally leave their homes and ride the subway after a day on lockdown. 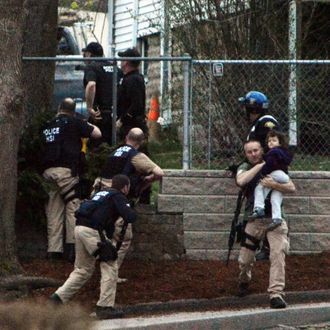 But less than an hour later, gunfire broke out and police began descending on a position in Watertown where Tsarnaev is thought to be hiding. Update, 10:51 p.m.: Boston is very happy about the way this day ended. Update, 10:17 p.m.: “All in all, it’s been a tough week,” Obama said, after praising the investigators and emergency responders who sought the suspects in the Boston bombing. “We all owe a debt of gratitude to our law enforcement professionals,” Obama said. Update, 9:55 p.m.: Col. Alben tells reporters police used a forward-looking infrared camera to spot Tsarnaev in the boat, which was just outside the perimeter where police were searching. 9:52 p.m.: Boston Police Commissioner Ed Davis, speaking at a press conference, said the break in the search came when authorities lifted the stay-at-home order and the resident at the house where the boat was went outside. The resident saw blood on the boat and went over to inspect, pulling back the tarp covering, and saw Tsarnaev, bloody, lying there. He immediately went back into the house and called 911. Tsarnaev was covered in blood when police found him. “We assume he sustained those injuries the night before. There was an exchange of gunfire at the boat, but we don’t know if he was struck,” Davis said. Update, 9:44 p.m.: Tsarnaev was not read his Miranda rights “because government is invoking the public safety exception,” CBS reports, citing a Justice Department official. The reading of Miranda rights is one of the best-known parts of any arrest — you have the right to remain silent, a right to an attorney, etc. But they can be waived in special cases. Update, 9:04 p.m.: Boston Mayor Tom Menino and local police are understandably jazzed on Twitter. Update, 8:56 p.m.: Tsarnaev is “alive, conscious, captured,” a state official tells the Globe. He’s injured and will be taken to a hospital where a police officer injured in last night’s shoot-out is also recuperating. Tsarnaev going to Mount Auburn Hospital Cambridge, same hospital where Transit Police officer is recovering from gunshot wound. 8:45 p.m.: It’s over. Tsarnaev has been taken into custody alive. A cheer could be heard among police on NBC’s live broadcast. Update, 8:33 p.m.: Boston.com is now reporting via twitter that three suspects have been taken into custody in New Bedford in connection with the attack on the marathon. BREAKING NEWS: New Bedford police say they assisted feds in executing a search warrant on home in New Bedford. Update, 8:27 p.m.: A negotiator has arrived on the scene, NBC is now reporting on its broadcast and Twitter. Neighbors have told the Globe, meanwhile, that Tsarnaev is “covered in blood.” But police are reportedly still wary that he is wearing a suicide bomb vest. Update, 8:01 p.m.: NBC’s live broadcast reports police are “assaulting” the boat. The bangs we heard earlier may have been flash-bang grenades police were using to disorient the suspect, the Globe reports. BREAKING NEWS: Police are using 'flash bangs' to disorient and distract the suspect. They have seen him sit up. Update, 7:50 p.m.: More gunfire has broken out on WCVB’s live feed. Several bangs could clearly be heard. Follow that broadcast here. Update, 7:46 p.m.: The suspect is moving after all, WCVB reports. He’s apparently still in the boat. Update, 7:44 p.m.: The Boston Globe tweets that police are moving in on the boat. BREAKING NEWS: Police have taken the cover off the boat containing the man believed to be the Marathon bombing suspect. He's not moving. Update, 7:29 p.m.:. 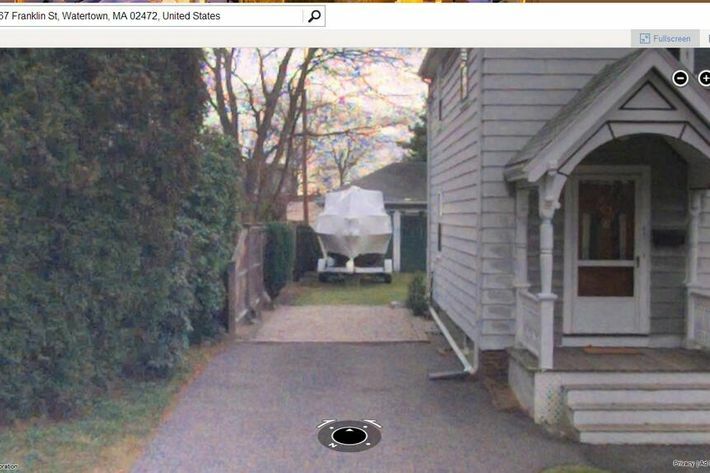 The latest incident started when someone noticed blood on a boat in the yard of 67 Franklin St., Watertown. A witness tells WCVB that twenty or so shots were fired. The Boston Globe cites witnesses who describe “pandemonium” at the scene. Update, 7:15 p.m.: The stay-inside order has been reinstated as black police vehicles move in on a position at 67 Franklin, where the suspect is apparently hiding in or near a boat, according to WCVB’s live feed. Update, 7:08 p.m.: The Boston Globe reports via Twitter that shots have been fired and the suspect is pinned down in Watertown. 7:04 p.m.: At a press conference in which Gov. Deval Patrick announced the end of the stay-at-home order and the reopening of the T and other public transit, Massachusetts State Police Col. Timothy Alben said Tsarnaev had fled on foot and was thought to be still in the Boston area. He also said Dzhokhor Tsarnaev and his brother Tamerlan, who died in last night’s shoot-out with police, did not rob a 7-11, as had been reported, but just happened to be there when someone else robbed it. The Tsarnaev brothers had been suspected of kicking off Thursday evening’s chaos by robbing a 7-11 before they shot a Massachusetts police officer, carjacked a vehicle, and led police on a chase that ended in gunfire.